Be forewarned that this starts out strange and gets weirder as we go along. There is of course the low-budget indie-film studio known as Troma and they make weird little gross-out comedy flicks. One of their most famous characters is the Toxic Avenger. Toxie, as he is sometimes known, is from New Jersey and fights crime in movies that had to be heavily edited to achieve an R-rating and which have all kinds of inappropriate, raunchy, tasteless humor...not for kids, right? Well, at one point Marvel made comics themed for the Toxic Avengers that were more youth-friendly. 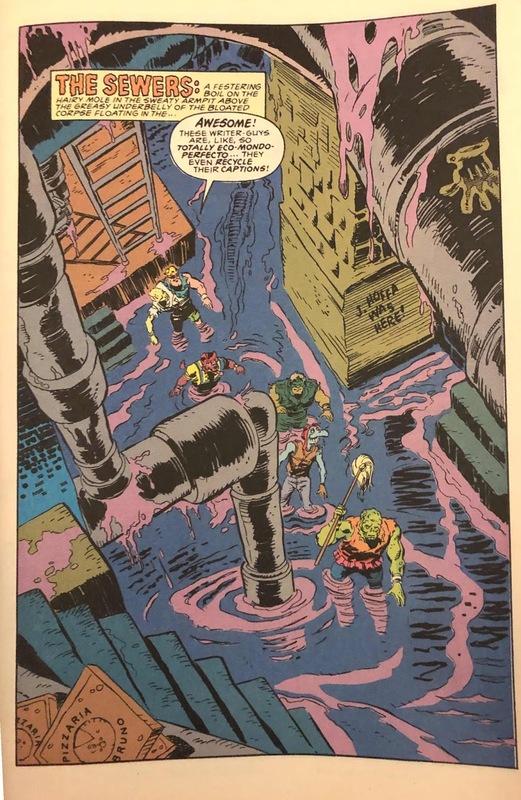 That's interesting, but in a further bizaare twist--I didn't even know about this one and I know a smidgen about Troma and Toxie--there was a 1990's cartoon aimed directly at kids called, "Toxic Crusaders." 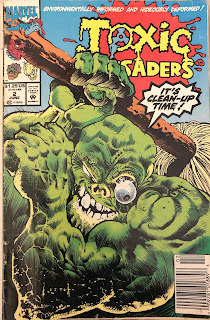 "Toxic Crusaders," was about Toxie and a bunch of misfit superheroes fighting pollution--like a weird, "Captain Planet," kind of vibe, I guess. The cartoon ran all of 13 episodes and was cancelled, but Marvel made a spin-off comic of it for a short while, which went eight issues and had some surprising talent involved. There was no set writer or artist so there were at times Steve Gerber contributing, or Ann Nocenti, and more. That's bizarre and fascinating to think some folk who went on to become big names (or who were already known to some degree in 1992 when the comic came out) did this random comic, of all things. Great art and a funny meta-joke about the captions? This comic rises above its source material for sure. Let's be honest, all those old, "Toxic Avenger," movies are pretty shoddy. They have a certain, "Oh no they didn't!" kind of charm, but to say the movies are actually, "Good," is pushing it. Hearing that a big-budget reboot might happen with Toxie at another film studio sounds like it really misses the point of the old stuff, but more power to anyone attempting that. Still, I'm just frankly bewildered by this, "Toxic Crusaders," comic series having its level of quality. I found issue #2 whilst digging in the dollar bins (you never know what gold you'll find in them, after all), and it features the writing of Hilary Barta and Doug Rice with pencils by Joe Staton (yes, the Joe Staton)--again, it is shocking the talent these books got. It's a perfectly well-done read full of clever jokes and it looks great thanks to the artwork. It is just odd to see these strangely competent and professional comics that relate (however loosely) to a film property from a studio that prides itself on being tacky and amateurish. It is a little strange to find something as odd as a spin-off comic from a cartoon that was itself a weird kid-friendly outgrowth from another property ( one which was extremely adult in nature), but it is outright inexplicable that such a comic series be as good as it was with such a degree of talent involved. I suppose it goes to show how you can find a shocking amount quality in any comic, even one that is a...tale from the dollar bin!